Caroline Mondschean focuses her practice in professional liability litigation and appellate work, including the defense of attorneys, trustees, accountants and other professionals. Ms. Mondschean has more than 20 years of jury trial, litigation and client advisory experience including representing law firms and lawyers on litigation avoidance and lawsuits arising out of a myriad of underlying practices, including tax, trust, intellectual property, corporate transactions, personal injury and domestic relations. Ms. Mondschean has extensive professional liability experience, successfully resolving lawsuits involving legal malpractice and breach of fiduciary claims brought against lawyers and trustees, accountants, brokers and other financial malpractice claims. 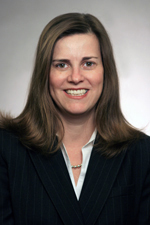 Ms. Mondschean joined Hinshaw & Culbertson LLP in 1989. She has been a member of Hinshaw’s Lawyers for the Profession® practice group since joining the firm. "Professional Responsibility Update," Illinois Institute for Continuing Legal Education - Professional Injury Practice Update, April 2014. "Social Network Media - Will you be my Facebook Friend?" West LegalEdcenter, live webcast, May 2013. “Update on Illinois Rules of Professional Conduct and Social Media and Legal Ethics,” in-house CLE presentation, Chuhak & Tecson, P.C., Chicago, Illinois, July 2011. “Ethics and Risk Management,” Chuhak & Tecson, P.C., Chicago, Illinois, May 2011. “Ethics for the North Suburban Lawyer,” North Suburban Bar Association, Skokie, Illinois, April 2011. Carrie lives in Chicago. She is an avid long distance cyclist and a huge Chicago White Sox fan.